What roller rockers would y'all recommend for a 340 with edelbrock heads? Best bang for the buck? Are the PRW's still steel? Set I have are stainless. They worked great on a 360 W2 setup.. Harland Sharp has a new setup for the LA motors.. But back in the day I was constantly wasting Harland Sharps on a BBC...so I would be hesitant about them... Then again..alot has changed in 20 years.. I'm like mutt in choice, however, i used harland sharps with no problem on a .642" lift cam, long time ago. above that, they might have a problem, I don't know. Jesel offerd me a set, I said no thanks after the problems BK had. On my current build, I'm staying with those who have always performed for me. Milodon oiling, Speed pro rings, Moldex crank, Venolia pistons and rods, chet herbert cams, Ed Hamberger Goodyear and Centerline. Oh yeah, for outlaw meets VP hydocarbons for methanol, gas too, and NITROUS WERKS! Wouldn't it be nice we could all play like the old days? claim your time and class, and take the handicap spot. I have a feeling that several members, including me, would go for that. hope ya'll are well, done now. Go with a doctile rocker arm rather than rollers. Unless you want the 'WOW I GOT ROLLER ROCKERS' factor they will do nothing performance wise for you. After you reach a certain lift they may help some with side loading. I have seen them come apart and they you have little pieces all through the engine. The needles also are a high wear item as they never make a full revolution on the needle axle. They rock back and forth on the same few needles and axle area. The needle bearing rockers are a fairly cost-effective solution but they have reduced life expectancy. All the pressure and shock in the valve train is concentrated on 1 or 2 needles at the most. The rockers only rock in a small arc of approximately 25 or 30. If the rocker or the shaft actually rotated the needles would live longer. Here again is a conundrum. The smaller needles spread the load over more needles, but they are more fragile you just cant win! The unit loading is very high with needle bearings. All these extra parts are just more points of potential failure. I just bought a set of aluminum PRW's, full kit with grooved shafts. Good price and my speed shop guy says they have not had any come back like some others they have sold. Nice kit with bolts, spacers, shims and full needles on the shaft. Not yet installed but I think I'll be happy with this product. Take a look at Hughes engines roller tip kits. Hey halory, I told you wrong, the shafts don't have oil grooves they're not needed with needle bearings. 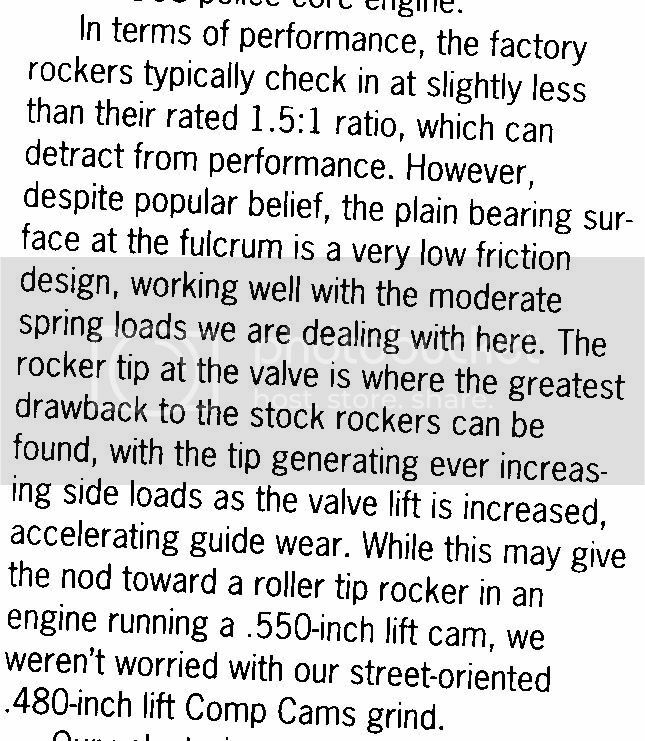 Btw, the Iskys I mentioned.....the cam was a .660 lift roller but the rockers were ductile iron....non roller. Ya know.. in the end it's all about heat.. and heat kills those little bearings..
heat and rocking back and forth on the same spot & same needle with the spring pressure on that side and never making a full revolution on the shaft. Alot of these parts are coming from China, that is a big problem. if they do not then they have parts from their. Now that Crane is back in business did yu check with them or possibly Jessel?? Look at Hughes rockers non roller on the shaft.